Type locality: Coast of France. Octopus vulgare Cuvier, 1797: 381.—Hemming, 1954: 278, 288, 291-293. Octopus vulgaris Lamarck, 1798: 130.—Stearns, 1893: 339.—Robson, 1929: 57–62.—Adam, 1952: 117–125.—Pickford, 1955: 156.—Lane, 1957: 221. Quinteiro, J., Baibai, T.. Oukhattar, L., Soukri, A., Seixas, P. & Rey-Méndez, M. 2011. 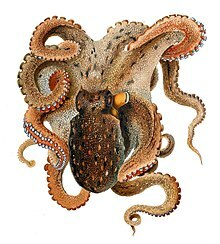 Multiple paternity in the common octopus Octopus vulgaris (Cuvier, 1797), as revealed by microsatellite DNA analysis. Molluscan research 31(1): 15–20. Abstract (with link to full article). This page was last edited on 25 February 2019, at 22:27.